Two further milestones were passed today: the riders have now cycled further than Life Cycle 1 (1,037 miles) and Life Cycle 2 (1,087 miles). That puts the current challenge in perspective. Well done to all. Today we were riding for Boyan Wei. I had the pleasure of meeting Boyan and his Mother at a recent CBTR event. Nick was the designated rider for Boyan and here is what he had to say: ‘Boyan’s Mum’s words say it all – “We are the lucky ones, this story has a happy ending”. Thanks to the expertise in Nottingham’s Centre for Children’s Brain Tumour Research, he is now a happy, healthy six year old. So, getting on our bikes and enduring a bit of pain will be absolutely worth it, if that gives young people like Boyan, and their families, hope for a bright future’. I have no idea of the order in which riders left this morning. All I know for sure is that Nick again waited back for me, and we left at 08:10. David R and Ottilie were staying at the same place and left after us. Loch Fyne was resplendent in bright sunshine when we set off, it looked stunning. The first 10 miles took us around the northern end to Inverary. It was flat running. My legs were heavy, so that was welcome. 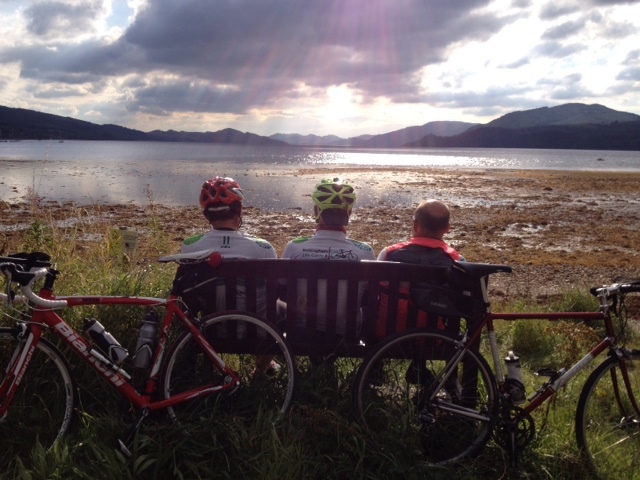 From Inverary however, we had a hard six mile climb, before a glorious descent to Loch Awe. We were planning to catch up with the others for the first break, but miscommunication and intermittent signals meant we rode straight past everyone else in the Falls of Cruachan Tea Shop. So Nick and I took our first break at 36 miles in the Robin’s Nest Tea Shop in Taynuilt. 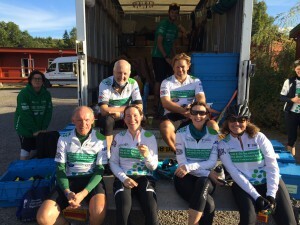 We picked up Chris J, Karen, Marion, Steve, Svenja, Nieves and Susan at 50 miles and we rode on together to a meal break at a restaurant and shop overlooking Castle Stalker (no doubt historically famous, but more recently used in ‘Monty Python and the Holy Grail’). It a truly stunning location, to the west you could see all the way through to Mull. Over the remaining 33 miles we worked our way up the side of Loch Linnhe, through Fort William and on to Spean Bridge, and had a final refresh in Morrisons car park in Fort William. Of the goodies Helen bought, I had: a pink lemonade fizzy Lucozade, a banana, a nutty chocolate Cornetto, and a raspberry and white chocolate swirl milk shake (in that order of course). Not exactly a balanced diet, but I belted out the final 10 miles of a 93 mile day with renewed vigour. Over the last 10 miles Nick and I picked up David and Ottilie, then Doug, and were in before 18:00. Chris R and Penelope arrived just before us. Everyone else followed shortly after, and were all at the destination by 18:20. Amazing really for such a long ride. We are in two separate locations this evening. 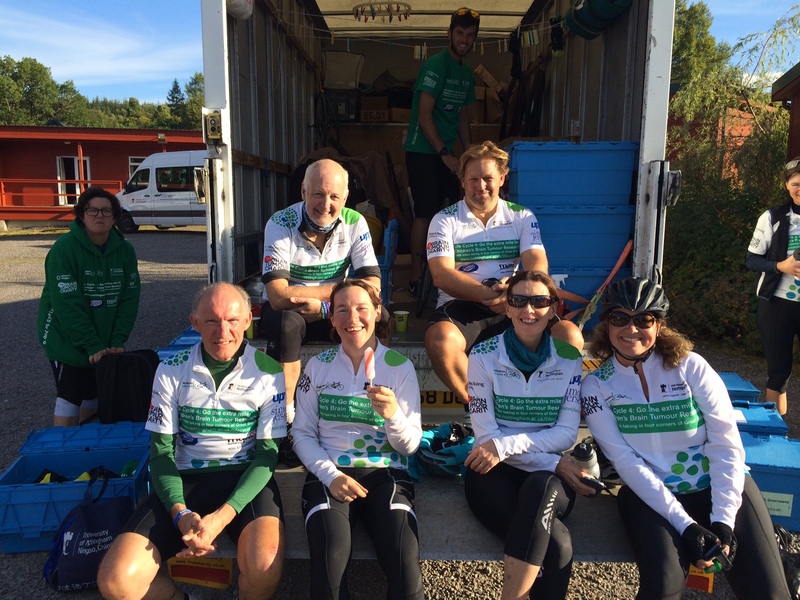 Most were at the Spean Bridge Hotel, where we stayed on Life Cycle 2. Happily it could not accommodate all of us. So Karen, Marion, Nieves, Penelope and I were in the Spean Bridge Lodge, a wonderful B&B, in a lovely setting, with excellent rooms and hospitality. Today was an astonishing day really, you just run out of superlatives to describe what you are seeing. The landscape was simply breath-taking, and that combined with perfect weather made for a day when 93 miles was easier to handle than on other days. Spirits were undoubtedly lifted, which is good, because serious fatigue is setting in. More people are sleeping in more places, and bedtimes are getting earlier. But that is hardly surprising. This is tough. On wear and tear, Susan’s thigh has improved, though it has clearly slowed her down; and Svenja’s knee has gone. Application of various magic creams has eased some of the rear end problems (though there is absolutely nothing you can do about the numbing effect of being glued to a saddle for hours on end). But people don’t complain, they just get on with it. Now to reports on team matters. I have been asked for details on high value items in the Life Cycle 4 auction. I actually capped bids at £100, and the following went for that sum: two framed portraits entitled ‘Cycling Groupie Number One’ and ‘Cycling Groupie Number Two’; Andy’s wig; the first edition CD of CJ and the Jaggerettes (which is probably rising in value already, given the break up); and a tea tray and tea towel. More misdemeanours and fines for: Andy (using his mobile whilst riding), Esteban (red light), Chris J (parking his bike in a disabled bay) and me. In my case it was two successful challenges to blog content. For Day 10 Karen correctly pointed out I do not have two right hands; for Day 6 Chris R corrected me on who he had ridden with. It turns out he was with the Jaggerettes from Guildford, went to a Costa to buy them all lemon drizzle muffins, and when he came out, they all pushed off. On both counts I will pay my fines, but I think CJ and his Jaggerettes should be fined for such an blatant rejection of generosity. First, Glen, the proprietor of the Spean Bridge Lodge where Karen, Marion, Nieves, Penelope and I were: ‘If I give you all some bags, can we do your washing for you?’. Mmm, toughie. 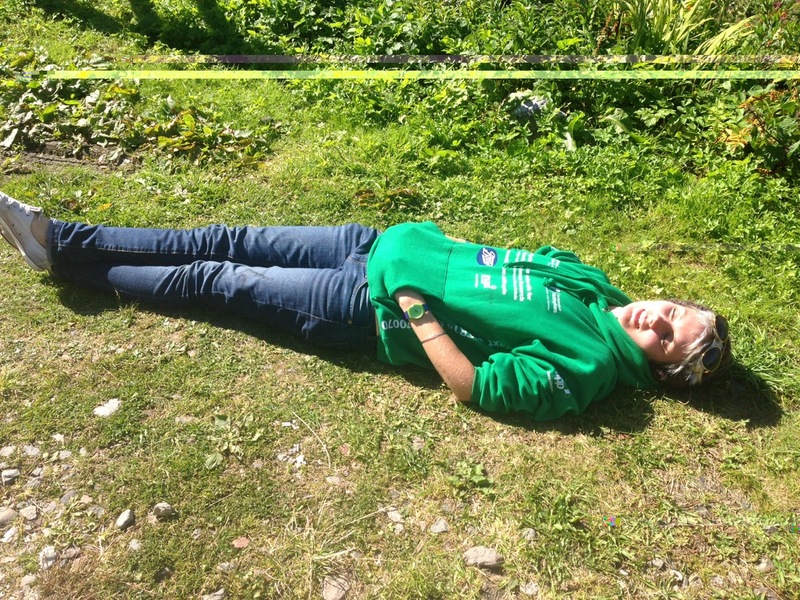 Second, Svenja when I saw her at the 50 mile point: ‘See I told you it never rains in Scotland’. Svenja, three data points might be 50% more than two, but it is still not a lot. Third, we ate at the Old Station Restaurant tonight. As Adam entered with Paul, he said: ‘I think this might have been a station before’. Hole in one, Adam. 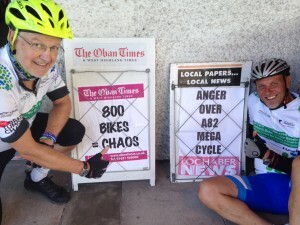 Fourth, as Nick and I were cycling through Benderloch, having failed to notice a sign to a cycle track, a very agitated Mr Angry got off a bus, hurled abuse at us and told us we should be on the Sustrans track because ‘billions were spent on it, and that is what it is there for’. We did get on it: millions maybe, but definitely not billions. Achievement of the Day: must go to our colleague and veteran Life Cycler, Gavin Scott, who completed his London to Istanbul challenge (also for CBTR). For current Life Cyclers, this is what you could do next? Team of the Day: our Support Team, for their uncanny ability to suddenly appear, when you are thinking ‘I wonder where the van is?’. They are stars. Finally, we have a further entry for the calendar: a ‘Last of the Summer Wine’ moment? Superb shot, Steve. That was our last 90+ mile day, taking us to 1,095. I would not say it is all downhill from here, but seeing the back of 90 milers is very welcome. Thank you again for all your support and comments. Super work once more and the end is coming into sight! Thank you for taking the time to write this wonderful blog. Another impressive day. The scenery you see must be fantastic, and such contrasts as you move from the Midlands to Scotland. I’m sure the others won’t thank you for even suggesting that it is all diwn hill! Glad to see though that you can see the light at the end of the tunnel, but I would not even want to do the “downhill” bit, let alone the first 1000+ miles! Hope the weather holds and that you enjoy the final ~300 miles. Fantastic efforts by all as the wear and tear kicks in and just hoping the scenery is doing its job of keeping you (safely) distracted! Special mention to Gavin for his amazing trip to Istanbul. What an achievement. Glad there is some time to appreciate that amazing Scottish landscape. One of my favourite poets (and people) Thomas A. Clark writes that ‘Every day should contain a pleasure as simple as walking on the machair or singing to seals’. Not sure you have much spare time in any day right now but hope you all get some time to reflect and enjoy. Ride well. Everyone at UNNC is willing you through the final stages. Following the blog with great interest – I still haven’t worked out how you can grind out the miles relentlessly and still eat and blog… etc…. good job there are 24 hours in a day eh?. I have nothing but great admiration for you all having had just the one day with you last week (I have just about recovered). The grit, determination and good humour is a sight to behold. Have a safe ride for the last stretch. Regards to all. Keep going, the rest of you. The scenery looks stunning, and coupled with the superb weather, it must have helped lift spirits on this last 90+ miler of Life Cycle 4. Congratulations to Gavin Scott on his fantastic achievement in cycling to Istanbul. Has this set a new challenge for an LC5. Thought for today: you can always spot a happy cyclist by the flies on his teeth! Fantastic going team! Not long now, all the very best for the last few days. Impressive day indeed – and not just for the distances. it is a beautiful part of the world – I just hope the aches and pains didn’t prevent you from really enjoying it! keep going everyone – you are doing a fantastic job! Fantastic work Mr Scott! Not long(ish) to go now, sounds like some wonderful scenery that’s set to get better the closer you get to JoG. Fingers crossed Svenja’s weather prophecy hold’s until at least Saturday. Great reading Dad, How do you keep those eyes open to write all this after staring at the road and Nick’s back….wheel all day! Keep pedalling and enjoy the final few days in fantastic surroundings, I hope the scenery eases the saddle sores. Once again, a huge congratulations to all of you. 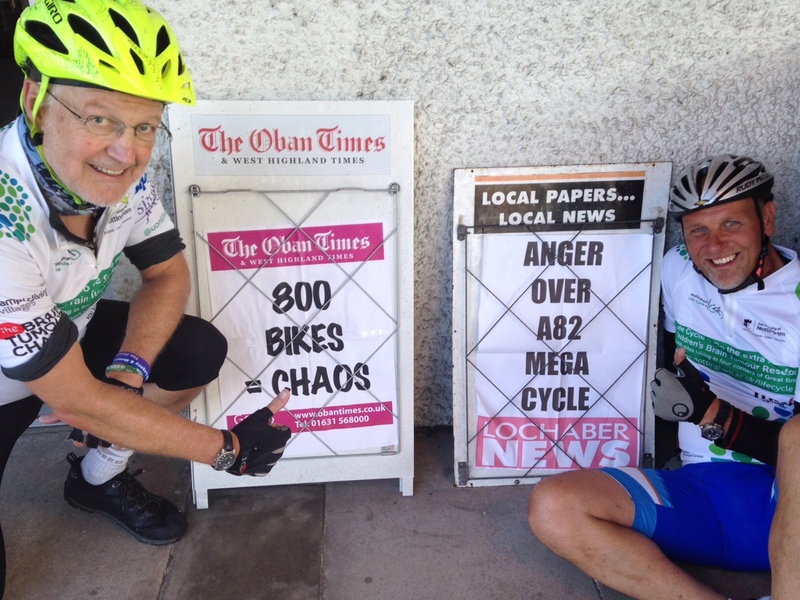 Well done on passing the 1000 miles (a blog too late I know) and also on chalking up the last 90 mile day. It’s great to see the pride in your efforts is reflected in the donations you have worked so hard for. Fantastic ‘blogging’ – don’t know how you find the time and energy after all that cycling. Really well done. Well done everyone -such an amazing achievement. I remember the scenery from LC2 as provably in my top 3 most beautiful I have ever experienced. So pristine and exquisitely quiet – fabulous that you have the weather to go with it and the spirit to soak it up. I adore the picture on the bench – if that is Loch Awe then it I seems about right! Gavin Scott – see what you’ve done? Drawn out mention of an LC5….Seriously extraordinary effort. Bravo to you! Almost there guys – I can feel the excitement from here. Congratulations for getting to Scotland, your 1,000 miles, just for getting on your bikes day after day! We are reading and enjoying the blog, thinking of you daily and wish you luck with the last few hundred miles. Just great to read every day what you’re doing – and wonderful to know just what you’re achieving for Children’s Brain Tumour Research. All the very best to keep bodies and souls together for the last few days. Intermittent web access leaves me keen to find spots where I can log on for the next exciting update. You are all doing brilliantly. Stay safe and look forward to seeing you on Sunday! !